Jack William Nicklaus won both the U.S. Amateur Open and the NCAA Championship in 1961, becoming the 1st player to win both in the same year. Soon after this accomplishment, he turned professional, joining the PGA Tour in 1962. Jack’s 1st professional win came in his 17th start the same year, defeating the heavily-favored Arnold Palmer in a playoff at Oakmont for the 1962 U.S. Open. At age 22, Nicklaus was the youngest U.S. Open champion since Bobby Jones won at age 21 in 1923, and he has remained the youngest winner since. By the end of the year, he had picked up 2 more wins; the Seattle Open and the Portland Open. In addition, he tied for 3rd in his first attempt at the PGA Championship. Nicklaus completed 1962 with over $60,000 in prize-money, made 26 of 26 cuts with 16 top-10 finishes, placed 3rd on the PGA Tour money list, and was named Rookie of the Year. In 1963 Nicklaus won two of the four major championships – the Masters and the PGA Championship. These victories made him the then-youngest winner of the Masters and 3rd youngest winner of the PGA Championship. Earlier in 1963, Nicklaus injured his left hip playing an approach shot from the rough – an injury that would manifest itself years later. Ironically, Nicklaus credits this injury with assisting him in altering his swing heading into the 1963 Masters, allowing him to play a draw more easily. Along with 3 other wins including the Tournament of Champions, he placed 2nd to Arnold Palmer on the PGA Tour money list with just over $100,000. He also teamed with Palmer to win the Canada Cup (now the World Cup of Golf), representing the United States. It was during this period of time that Nicklaus’s nickname of “the Golden Bear” became a world-wide icon. Through 1971 to 1975, Nicklaus enjoyed several more very successful years. During those years, he collected: Official Worldwide Tournaments Played: 101, Victories: 30, Runners-up: 12, Top-5 Finishes: 64,Top-10 Finishes: 81, Missed Cuts: 0 , Major Championships Played: 20, Major Championship Victories: 6, Major Championship Runners-up: 4, Major Championship Top-5 Finishes: 17, Major Championship Top-10 Finishes: 19, Ryder Cup Record: 11-4-2. 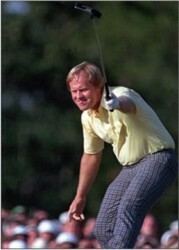 Beginning in 1990, Nicklaus joined the Champions Tour at the age of 50. His last official career win came in 1995, off a win over Hale Irwin. Nicklaus has also taken part in various off-course activities, including golf course design and running his own tournament on the PGA Tour, the Memorial Tournament. His thriving golf course design company is one of the largest in the world.